Auric Air, Tanzania�s premier safari and charter airline, has yesterday announced that they will increase their present 17 frequencies to Bukoba, the country�s main town on the Western shores of Lake Victoria, to 19 overall, effective 20th of September. The added frequencies will operate on Saturday and Sunday. The flights from Mwanza to Bukoba are also extended three times a week to Entebbe in Uganda, all services operated on the airline�s workhorse Cessna C208B aircraft of which they now have a fleet of 10. Auric now serves 20 destinations in Tanzania, plus the Masai Mara and Entebbe, many on a scheduled basis and more on a charter basis, all shown below with the option to click on any of them and get additional information about those destinations. The increase in flight frequencies was made possible by the arrival recently of another brand new C208B two weeks ago, coupled with strong demand for the route. Experience the safari of a lifetime on board a Scenic Air Safaris luxurious Cessna Grand Caravan aircraft. Journey to the most magnificent places Tanzania, Mozambique, Zambia, Zimbabwe, Malawi and Botswana have to offer and enjoy the true African safari experience. A combination of luxury and adventure await, from the beautiful scenery to the wildlife, people and extraordinary properties, all guaranteed to take your breath away. Whether you go on a game drive, enjoy one of the many activities available in the camps and hotels, or just relax and enjoy the moment, this extraordinary journey will create memories to last a lifetime. Our Air Safari, which took place during the 10 days of Christmas 2003, began with a seafood dinner on the patio at one of my favorite places, "The Slipway" on Dar es Salaam's rapidly-changing waterfront. At this unique shopping mall, now in its third or fourth stage of development, we were introduced to the owner Nicola Colangelo, an exceptional person and gracious host. 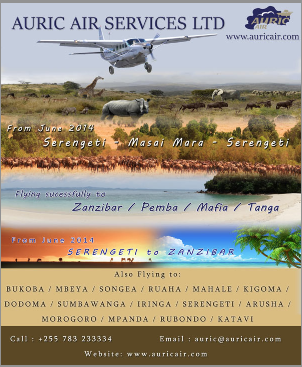 Having just completed two weeks of dawn to dusk sessions at conferences in Zanzibar and at Dar es Salaam's Golden Tulip Hotel, the idea of flying on the Coastal Air Safari circuit had a special appeal. Another good omen that same day was our reunion, after five years, with popular entertainer King Kiki, the Swahili Coast's Louis Armstrong - his musical beat goes on forever. The Slipway is a magnet for creative people of all types, as some of the top local artists create and display their works on the broad square facing the harbor. Photo-above: Muguette Goufrani (left) with Mangers Sean and Fiona Torrie, and Mr. and Mrs. Zannuchi (right), owners of Adventure Camps at Selous. We enjoyed Christmas dinner with this wonderful group. Magazine's Editor Jerry Bird and myself were familiar faces around the Dar es Salaam Regional Airport and the Coastal Air office in particular. Before describing our back to back adventures, that involved flights on Coastal Airlines' Cessnas to Mafia Island, and later to two tented camps - - the new Impala Camp at Selous and Old River Camp at Ruaha, here is some basic information provided by our hosts. Photo Sequence (top): Christmas Dinner with Mr. and Mrs.Zanacchi, owners of Imapa Camp, Selous, their management teram and holiday visitors. Above: On the deck of our attractive tented unit at Impala Camp. Agenda: Flights start daily from Dar es Salaam and Zanzibar to the Selous; then to Ruaha and finally to Zanzibar - to shake of the dust on the pristine palm fringed white beaches. Coastal Aviation Tanzania and Coastal Travel Services are "connecting the dots" of the diverse Tanzania tourism product. Now travelers can more easily combine the Southern and Northern circuits explore the Spice Islands and Swahili culture of Zanzibar or snorkel and dive in the coral-studded Marine National Park in Mafia Island, all on the same Safari. 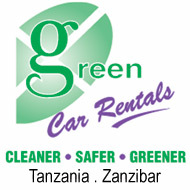 Coastal Aviation, developed by Dar es Salaam-based Coastal Travel Ltd., pioneered scheduled flying safaris in Tanzania. Coastal Director Nicola Colangelo, said that the company has invested USD 10.5 million in new aircraft alone. "Our flying safaris are so successful because they offer the opportunity for small parties and single persons to join an adventure which otherwise would have been an prohibitive cost." As Tanzania tourism is expanding, Coastal Aviation created new safari combinations that were never possible before. In the next two years, Coastal will invest an additional USD3 million in aircraft and USD million in camps and lodges. A truly beautiful camp located on the banks of the Rufiji River, in Selous Game Reserve. There are just 6 beautifully furnished en-suite tents at Selous Impala built on platforms, giving superb views of the Rufiji River and its wildlife. Set amidst Borassa Palms and Tamarind Trees. The camp provides superb comfort and wonderful wildlife. Hosted by the widely experienced Sean and Fiona Torrie they will ensure warmÊ hospitality and good food; dining under the stars. Selous Impala has skilled and knowledgeable guides who will lead the game drives, boat trips, walking excursions and fly camping, and ensure the best possible game viewing experience. Opening officially for the 2004 season on 4th June, the Rate will be just $350 gross per person per night sharing, inclusive of park fees, full board accommodation and two activities.